However, we grow for 40 shares and we are not certain there is enough corn for every share to get a couple of ears. It might just be one. Which seems odd. We have grown corn every year but have never had a harvest to distribute. This year we conducted our own, not totally scientific experiment. 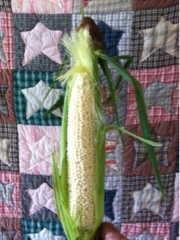 Same growing conditions, two types of corn. Water and compost and soil covered in black plastic for weed suppression. The Silver Queen, as it has every year, fails in this environment. The Country Gentleman was our big winner, and will be all we plant next year. It has been fun watching it grow, set ears, produce silk and now, eat. We cut it off the cob, mixed with summer squash, eggs and cornmeal and cooked into a fritter/cake kind of thing. Salted while cooling. Along with it we roasted a (scratch and dent) chicken. It was delicious, and I want it for breakfast. Because it was that good. We have to restrain ourselves from picking corn when it looks ready. It is only really ready when the silks dry up and the ear is really full. And it is true, the tight twist at the top stopped the bugs getting into the ear. 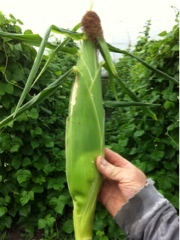 The Silver Queen corn is covered in bugs and the corn worm as well. The Country Gentleman went in and needed nothing from us. We cheered it as it grew and grew and last night cheered again as we pulled the husk off, cut the corn off the cob, tasted it raw and then cooked and ate it. It looks a little odd but the taste is kinda great. Our goal has been corn without insecticides, herbicides or any other killing stuff. No terminus GMO corn here. Shoe peg corn. It's what's we are cooking today!